Editor’s note: Olga Oliker is associate director of the International Security and Defense Policy Center and a senior international policy analyst at the nonprofit, nonpartisan RAND Corporation. Keith Crane is director of the RAND Environment, Energy, and Economic Development Program as well as a professor at the Pardee RAND Graduate School. The views expressed are their own. Ukraine is burning. Ongoing fighting between government forces and insurgents in eastern Ukraine have left more than 2,000 Ukrainian civilians dead and some 300,000 displaced, according to AP. Meanwhile, in large swathes of the Donetsk and Luhansk regions, those who remain lack food, running water, and electricity. If the West is serious about preventing things deteriorating further it needs to find a new approach – and one that makes Russia part of the solution. The Ukrainian government argues that it is doing its utmost to avoid civilian casualties in eastern Ukraine, but it is believed to have been using Grad rockets, an inaccurate weapon that makes this particularly difficult. The separatists have for their part also used heavy weapons indiscriminately, killing Ukrainian civilians and likely accidentally shooting down Malaysian Airlines Flight 17. In an effort to convince Russia to stop supplying the separatists with weapons and other kinds of support that have kept the conflict going, the European Union, the United States and their allies have imposed economic and travel sanctions on Russian citizens and companies in an effort to change President Vladimir Putin’s policies. Two weeks ago, Russia responded by banning food imports from most of the countries sanctioning it. Yet despite a running joke among some critics that Russia has become the latest country to sanction Russia, most Russians have maintained their long-running support of Putin. Of course, the Russian government claims that it, too, wants peace in Ukraine. But neither Ukraine nor most European states believe it, a point underscored by the voicing of suspicion that Russia’s humanitarian aid convoy, dispatched last week, was in fact cover for a military incursion. Why is Russia continuing to destabilize Ukraine even at the cost of what had been solid political and economic relationships with European Union countries? From Moscow’s point of view, Ukraine is only one part of a larger battle, one in which it is finally standing up to decades of U.S. hegemony and bullying. Never mind that it was Ukraine’s withdrawal from the EU Association Agreement that led to the Maidan protests and, ultimately, the end of the Yanukovych regime – the vast majority of the Russian public believes the United States was behind it all, and that the United States is simply trying to weaken Russia. Russia, for its part, says it has vital interests in the countries that have emerged from the former Soviet Union, and suggests that the United States and EU should stop meddling in Russia’s regional sphere of influence and accept that Russia will always have a pre-eminent role in Ukraine. Unfortunately, however ridiculous Russia’s reasoning may seem in the West, and however bellicose its approach, Ukraine will not enjoy peace without Russian acquiescence. The reality is that the Ukrainian-Russian border is too long and too porous to prevent people, arms, and funds from flowing across it. Without cooperation from Russia, Ukraine is in for a long period of violence. Ending insurgencies actively supported by a neighboring power can be nigh impossible. Moreover, Ukraine needs normal economic relations with Russia if it is to emerge from its current recession – Russia is Ukraine’s largest source of imported energy, electricity, oil and natural gas, and its second most important export market after the EU. Even if Western sanctions help forestall a direct military invasion by Russia into Ukraine, they are unlikely to induce Russia to take positive steps to resolve the conflict. Sanctions are a long game, and tend, at least initially, to result in publics rallying around the flag. Russia has talked a good game on Ukraine, with calls for ceasefires and the afore-mentioned humanitarian aid mission. With that in mind, then, one way out of this mess could be to internationalize some of Russia’s proposals, and do so quickly. For example, Russia has floated the idea of sending “peacekeepers” to eastern Ukraine. Why not create an international peacekeeping force under the auspices of the U.N. or the Organization for Security and Co-operation in Europe? Such a force could include a support role for Russia, but most of it would need to be composed of troops from other European countries, possibly from Sweden, Finland and Switzerland, none of whom are members of NATO. The Ukrainian government asked for a U.N. peacekeeping mission back in May. At the time, Russia opposed such a move. But in light of Russia’s current threatening posture, Moscow may find it difficult to both block an international mission and also advocate that it should carry out one on its own. True, putting a force like this together would be a significant challenge – other countries have struggled even to coordinate a sanctions-based response. But an international initiative that does not appear to emanate from NATO or the European Union could help bring Russia to the table, in part by accepting that Moscow, too, has a role. Importantly, an international peacekeeping force could open the way for a negotiated end to the conflict. 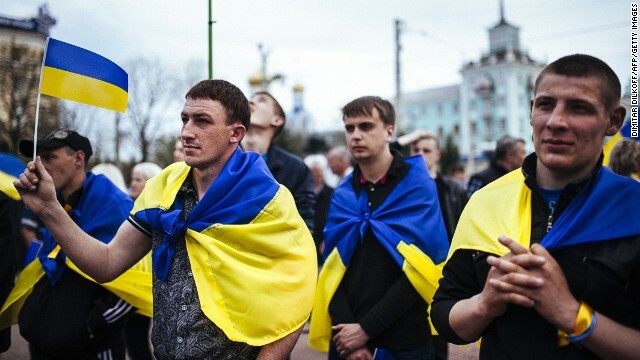 The alternative to being proactive in getting Moscow involved could be continuing hostility, something that would very likely doom Ukraine to a cycle of violence – even if the country finds military success. This was Kievan Rus – a powerful East Slavic state dominated by the city of Kiev. Moscow replaced Kiev as the new centre of spiritual and political power, becoming the Grand Duchy of Moscow. In 1547 Ivan IV (the Terrible), who was also Grand Duke of Moscow, crowned himself the first Tsar. Thank you, cuniverse. You know eastern European history. Most people posting here are totally clueless on the subject. That's the reason why we're getting all these ignorant anti-Russian comments. You know the history of Eastern Europe, cuniverse. Most people posting here do not! Go ogle "The US Failed In Hiding What the World Now Knows About Flight MH17"
Ukraine has pipelines controlled by US Carlyle Group of war profiteers. Same as Afghanistan. Get a clue. CNN and FAUX news both keep this secret from you. Quite true Philip, quite true. This is why we keep sticking our noses into places where we have no legitimate business! It is amazing how many opinions there are about one same thing. Everyone is so tangled around their own propaganda, clearly refusing to look at the situation from an independent angle. I guess "my truth" is based on what I have seen happening for the past 20 or so years throughout the world. What Russia is doing in Ukraine is exactly the same thing USA would have done with Canada or Mexico if they were allying with Russia. 1. Look realistically what 2 world wars had done to Russia – .....nothing, just made it bigger and tougher.